At ALG we offer four programmes, all of which give you the opportunity to experience life in a corporate law firm - whether you’re curious to know if a career in corporate law is for you or you’ve made your mind up that it is! Our LawStart, Student Placement and Summer Intern Programmes help us to identify candidates for our Trainee Solicitor Programme and give undergraduates a realistic job preview before accepting a position on our Trainee Programme. We see our trainee solicitors as key future members and leaders of the firm but also as valuable and much relied upon support for our legal teams during the trainee solicitor, intern or work placement period. Our trainee solicitors, interns and placement students assist us in successfully delivering for our clients time and time again. As a trainee solicitor with ALG you will have the best possible start to your career as a lawyer. As your traineeship progresses, we work with you to develop your own personal career path. As a trainee solicitor at A&L Goodbody, you can expect to receive excellent training in the practical application of the law from the moment you begin your career with us. We invest in your on-going development as a lawyer and as a trusted business adviser, because we know how important it is to reach your full potential. The foundation of our success as a firm is attracting great people and developing them into brilliant lawyers. We place a strong emphasis on your development, throughout your career with the firm. We provide a programme of development for each career stage, enabling everyone at ALG to be the best at what they do. In 2017 we launched the ALG School of Business and Law. Our school provides an integrated development programme for every stage of your legal career at ALG – from trainee solicitor to partner. 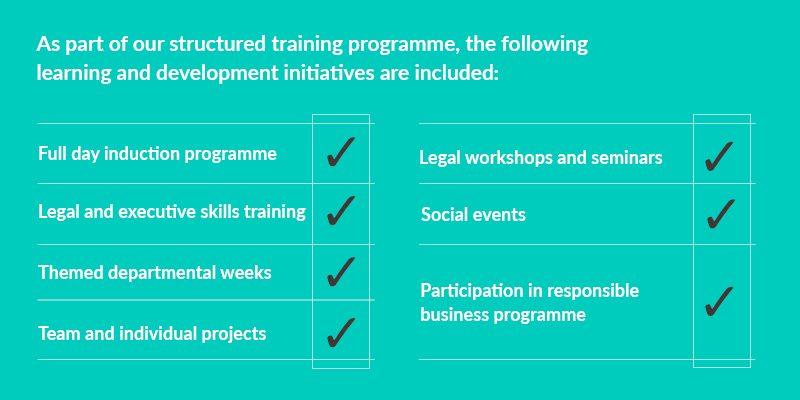 Each programme builds technical legal skills alongside executive business skills. Experienced lawyers work alongside external experts to develop and deliver practical and business-focussed training. Together we have developed a bespoke programme which is fully accredited to masters level. All of our lawyers at associate level have the opportunity to participate in the masters programme.Escalate is the firm’s three year programme for trainee solicitors and is the first stage of your career development with the firm. As a trainee solicitor at ALG, you are encouraged to own your development and maximise your opportunities. We know that being an excellent lawyer means more than just knowing the law. Our three year Escalate programme supports your development as a trainee solicitor and enables you to develop the legal, business, people and communication skills you need to be a successful corporate lawyer. In each year of your traineeship you will build and practice your skills in these areas. As a trainee solicitor you will complete four seats in our main departments – Litigation & Dispute Resolution, Corporate and M&A, Finance, Commercial Property, Taxation, and Pensions. This gives you the opportunity to learn through practice, discover where your interests lie and what you are really good at. Our range of specialist practice areas enables us to provide you with a degree of flexibility. The area of law you practice when you qualify will not be decided until you complete the Trainee Solicitor Programme. All of our trainee solicitors share offices with partners. This gives you the opportunity to develop your commercial awareness and learn from different working styles. In each seat you will also participate in training sessions designed specifically for trainee solicitors, in a formal training environment. These include department specific workshops, practice group insights, core legal development training, commercial awareness, advocacy and other legal and business skills. This training is delivered by partners and experienced lawyers in the firm, in conjunction with our talent and knowledge teams. The focus is on practical, hands-on learning through a combination of workshops, seminars and projects. Feedback is an integral part of your development at ALG. Our approach is friendly, we are always ready to answer questions and we actively encourage you to ask them. Assessment is both formal and informal and is a valuable opportunity to discuss your progress and areas of development you would like to focus on. In addition, you are paired with a guide throughout your traineeship. Guides are junior solicitors and act as a ‘go to’ person to help you get the most from your traineeship. They have recently completed traineeship themselves and can help you with both technical and non-technical questions, as you navigate the traineeship journey. Our Trainee Solicitor Programme is open to applicants who are final year undergraduates, post graduates and those who have successfully obtained a third level degree qualification. Our Summer Intern Programme (SIP) forms an integral part of the firm’s resourcing strategy. It’s importance is evidenced by the resources we dedicate to it throughout the firm. We offer four-week long, paid internships during June, July and August/September. We see the programme as an opportunity for you to learn from our legal professionals and for us to identify potential trainee solicitors. The SIP is run by our Trainee & Intern Programme team and supported by our Talent and Knowledge team. Together they are responsible for the development and implementation of the SIP. The team oversees the day-to-day running of the SIP and will liaise directly with you on a daily basis to ensure that your internship runs smoothly from beginning to end and that you get the most from your experience. All summer interns work within one of our main departments: Corporate and M&A, Litigation & Dispute Resolution, Finance, Commercial Property, Tax, and Pensions. As part of our structured development programme, each week we focus on what our main departments do. By the end of you internship, you will have a full appreciation of the work we do, who our clients are and the role of the trainee solicitor. As a summer intern, you experience the work of a trainee solicitor and are assigned to a legal team with a partner, associate and trainee solicitor buddy dedicated to ensuring you have a real and positive experience. You are fully involved in the work of your team and receive comprehensive ‘on the job’ training. Your buddy will help ensure that you settle in quickly and make the most of your internship. Our Summer Intern Programme is open to applicants who will have completed at least 2 years of their degree by summer 2019, post graduates, or applicants who have successfully obtained a third level degree qualification. Spend a day in A&L Goodbody to learn what it is like working here. Our LawStart Programme is designed to give you an insight into A&L Goodbody and to help you decide if a career in corporate law is right for you. You should consider a LawStart Day as the first step of your career in corporate law. We know that gaining work experience as a first or second year undergraduate student can sometimes be difficult. 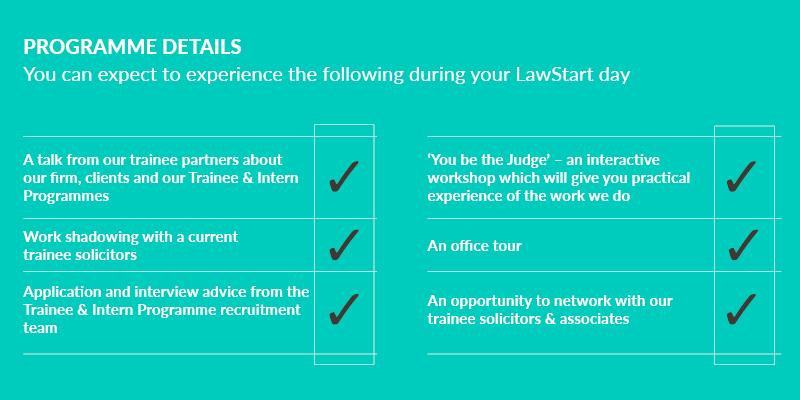 A LawStart Day will help you gain a better understanding of our work, our practice and our culture – insights that will help you with your application for our Summer Intern, Student Placement or Trainee Solicitor Programme in the future. Not only that, you will have the opportunity to personally experience, alongside our trainee solicitors and associates, the type of work that we do and the way we do it. We do not conduct interviews for our LawStart programme. You just need to submit your application online and we'll get back to you. Our LawStart Programme is open to applicants who are in the first or second year (non-penultimate) of their undergraduate degree. Our student placement programme provides students with an opportunity to gain practical work experience and apply the legal knowledge that has already been acquired in the early years of their undergraduate degree. Students on our Placement Programme are generally in the penultimate year of their undergraduate degree. As a placement student, you are assigned to a legal team with a partner, associate and trainee solicitor buddy, dedicated to ensuring you have a real and positive experience in the firm. You can expect to receive formal and informal feedback and mentoring throughout your placement. You will also participate in formal training sessions which, along with your on the job experience, help you to develop your legal, business, people and communication skills. Training is interactive where practical and includes weekly lectures, workshops and team meetings. All placement students are given the opportunity to interview for our Trainee Solicitor Programme. Placement duration varies, depending on the course and university. Our Student Placement Programme is open to all undergraduate students, who are attending a course that offers an integrated work placement programme. Students can apply through their university, by contacting their placement officer.